Update 05-30-14: I found this graphic at “KidneyBuzz”. Very well done. CLICK HERE to see it. 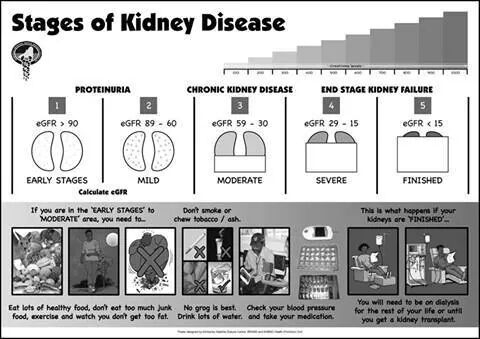 I came across this great graphic illustrating the stages of kidney disease. Unfortunately I can’t tell who created and published it so I can give them credit so if anyone knows, please let me know. It appears to be a British publication by the logo that’s on the top left of the page. I especially like how it makes the point in such simplicity. It’s important that people in the early stages of CKD begin to be proactive in their care. Some simple suggestions for that care are on the lower portion of the page. Basically, it’s eat healthy food and don’t eat fast food. Good advice, if only for the fact of avoiding salt/sodium and HFCS (High Fructose Corn Syrup). The giveaway that it’s not a US publication is the warning, “No grog” (alcohol). This entry was posted in CKD, dialysis, dietary restictions, ESRD, exercise, kidney, New Patient and tagged CKD, dialysis, diet, education, ESRD, hemodialysis, kidney. Bookmark the permalink.